Yet one more cookie for the cookie plate I’m bringing to my neighbor’s Christmas dinner (if I can get myself shoveled out). I made them in haste this morning while I was waiting for the snow to stop – hah! But here they are; the original recipe is from Cooking Light. 4.5 ounces all-purpose flour (about 1 cup) I weighed the flour, and it was about 7/8 cup. I expect different flours have different weights. Preheat oven to 350°. Spray a 9 inch square baking pan with cooking spray. The brownie batter: weigh or lightly spoon 4.5 ounces flour into a dry measuring cup. Combine the flour, cocoa, and salt in a medium bowl, stirring with a whisk. Combine brown sugar, oil, buttermilk, vanilla, 2 egg whites, and 1 egg in a large bowl; beat with a mixer at medium-high speed until well blended. Add flour mixture to brown sugar mixture; beat at low speed just until blended. Bake at 350° for 25-28 minutes or until top is set. Cool completely in pan on a wire rack. Cut into pieces. This is one of those recipes that called for 16 brownies, but they were huge, so, like with other bar cookies, I halved them. This thus made 32 brownies at about 4 grams of fat/brownie. Note: The recipe called for ¼ teaspoon of mint extract, but it wasn’t very minty. I read the reviews of the recipe online, and several said it wasn’t minty enough, so I increased the amount. I suggest that you add the mint extract gradually, and taste after each addition, so that you get the flavor that you want. Variation: I think it would be pretty sprinkle a couple of tablespoons of crushed candy can or hard mint candies over the top of the brownies while they are still warm, pressing them in gently. And you could certainly vary the colors. Confession: These are not the best brownie I have ever tasted. They were tasty, but they weren’t rich and chocolaty, and the texture wasn’t quite right. Maybe they needed to bake a little longer, but I think I am going to try the cream cheese topping over a really good brownie. I also thought the colored swirls looked a bit garish when the brownies were cut into pieces. Yet another potluck. And at short notice. They are providing the barbecued burgers and chicken. Usually I like to make something interesting and exotic that will wow people with my cooking prowess and shock them when I tell them it is low fat. But there are several factors that interfered with my usual strategy. With short notice, I don’t have time to go to the grocery, whatever I make has to be from ingredients I have in the house – a bad time to discover you’re almost out of brown sugar. It is on a week night, so it has to be something I can make after work. The gathering is way out in the middle of nowhere. So it has to be something sturdy that can withstand bouncing around on the seat of my truck as I get lost navigating dirt roads in the deep woods trying to find this place. 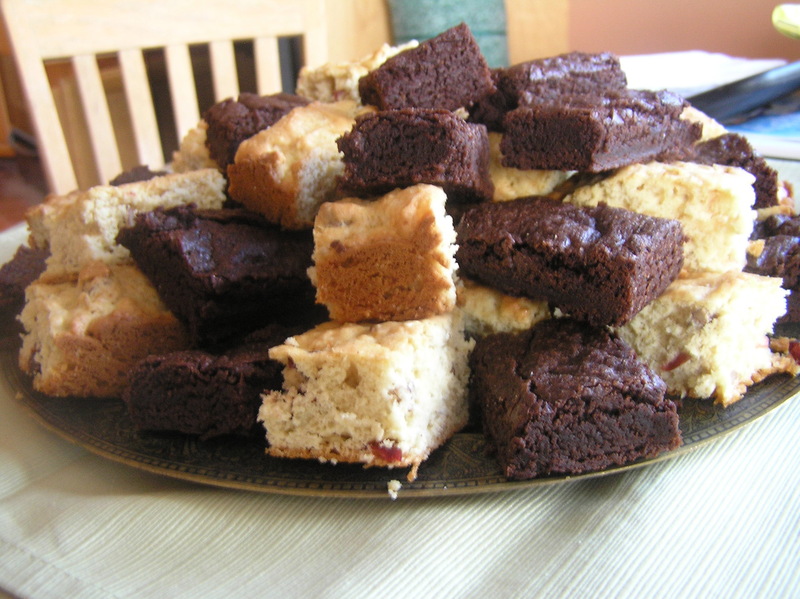 So the decision is: Bittersweet Brownies and Cranberry Pecan Blondies. It was a good decision, too, because I did indeed get lost out in the woods looking for the tiny hidden driveway onto their land, and almost everyone else brought a salad. About these Bittersweet Brownies. The recipe comes from Cooking Light, a magazine you should seriously consider subscribing to. These are some of the best brownies I have ever eaten. The brownies are moist, and if you love chocolate, they are positively orgasmic. Preheat oven to 350 F. Lightly coat a 9-inch square baking pan with cooking spray. Combine 1/4 cup water and coffee granules in a medium bowl. Stir in chocolate chips, stirring until they melt. Stir in butter, vanilla, egg, and egg white until they are well combined. Lightly spoon flour into measuring cups, level with a knife. Add sugar, cocoa, baking powder, and salt to the flour and whisk together. Add chocolate-coffee mixture to the dry ingredients, stirring until just moist. (This was very stiff to stir, even with a wooden spoon. I ultimately used my hands to make sure all of the dry ingredients were mixed in). Place batter into prepared baking pan, and smooth out so it is mostly even. Bake for 25 minutes, or until a wooden pick inserted in the center comes out clean. Cool on a wire rack. Sprinkle with powdered sugar if you are using it. Cut into servings. The original recipe said this made 18 brownies, at 5.8 grams of fat/brownie. This made mighty big brownies, especially to take to a potluck. I cut it into 24 brownies, at 3.9 grams of fat/brownie. 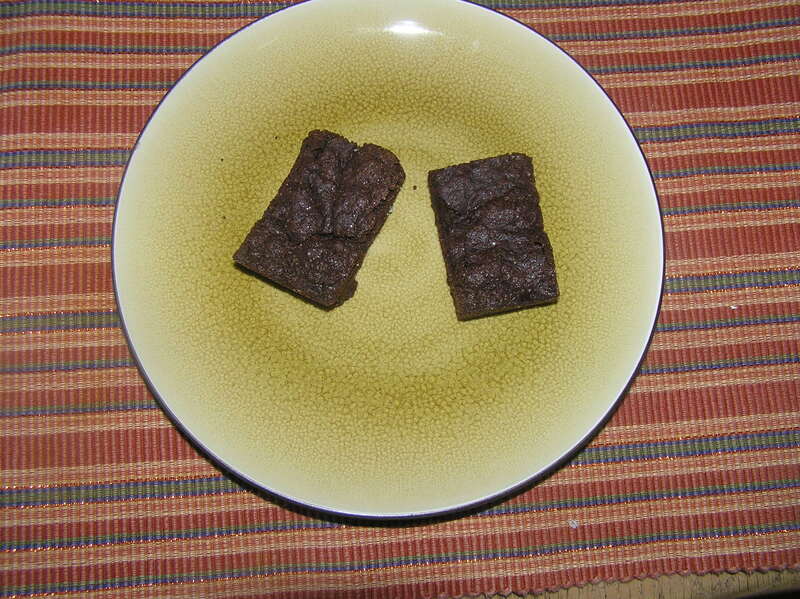 They were nice sized brownies, and since one of my Principles is that a snack should be 4 grams of fat or less, it brought them into snack range. Hint: it is difficult to substitute applesauce for butter in cookies. The trick is to have recipes that use less butter. Hint: For years, I just scooped the flour into a measuring cup and leveled it, the way my mother did. I recently learned it is better to lightly spoon the flour into the cup until it is overflowing and level it off. You don’t compress the flour, so the measure is more accurate, and your baked goodies are lighter in texture. Who knew? Yet another hint: When making brownies, cookies, and many other baked goods, you need to make sure the dry ingredients are thoroughly combined with the wet ingredients so there aren’t nasty lumps of unmixed flour in your goody, but not to beat them too much or your baked goodies will be tough. This recipe was an improvisation when I discovered that I did not have the ingredients for the oatmeal butterscotch bars I was going to make. They are a bit cakier in texture than brownies. Preheat oven to 350 F. Lightly coat a 9-inch square baking pan with cooking spray. Lightly spoon flour into measuring cups, level with a knife. Add oats, baking powder, and salt to the flour and whisk together. Put sugar and butter in a large bowl and beat with a mixer at medium speed until they are well blended. Add egg substitute, egg, and vanilla to the sugar mixture and beat until well blended. Add flour mixture and beat until the dry ingredients are just combined. Sir in nuts and fruit. Bake for 25 minutes, or until a wooden pick inserted in the center comes out clean. Cool on a wire rack. Cut into bars. This makes 24 bars at 3.8 grams of fat/bar. Hint: Toasting nuts brings out their flavor, so you can use fewer of them. Toast nuts by putting them in a small frying pan over medium heat, stirring occasionally. It takes about 5 minutes. They’re done when you can smell them – be sure not to burn them. Variations: These would be good with other dried fruit, such as raisins, chopped apricots, or chopped cherries.